James Witherspoon is a bigamist. This is the story of two families and one husband, told through the eyes of the two daugthers. The first daughter we get to meet is Dana. She is the secret. I loved the opening paragraph, Jones tells the reader exactly what they're are going to get. Dana and her mother both know James is a bigamist. Dana grows up knowing James will never love or claim her in public. James, other daughter, Chaurisse and her mother are in the dark. When the sisters paths cross years of secrets are revealed. The strength of this story lies in the complexity and ease in which the relationships are drawn. Jones has a beautiful way with words. She shows off her skills with a powerful opening paragraph. 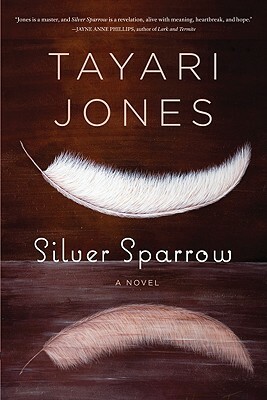 Silver Sparrow is firmly grounded in its setting, Atlanta in the 80's. Anyone familiar with the city then or now will recognize many of the landmarks. Living in Atlanta, I've been meaning to read one of Jones novels for a long time. This was a beautiful place to begin. It could've been set any where and I still would've loved it. This is one of my favorite books of 2011. Just thinking about this book makes me smile.